Nigeria will be eliminated from qualifying for the 2017 Africa Cup of Nations if they lose away to Egypt in their Group G tie on Tuesday. Results against group rivals Chad have been erased after their withdrawal on Sunday, meaning only the group winners will make it to next year's finals. Nigeria have two points and Egypt have four, while Tanzania have one. A win for Egypt would put them in a strong position to qualify but they could still be caught by Tanzania. Mathematically the countries could both finish on seven points, although Egypt have a far superior goal difference and a 3-0 win over Tanzania from their match last June. Each country in Group G now plays a maximum of four qualifiers. Home success at the Borg El Arab will lift Egypt to seven points and put the Pharaohs out of the reach of Nigeria, who will have just one game (at home against Tanzania) left. If the Super Eagles win, then they would hold the upper hand but would still need to win their last group game to make sure of qualification. 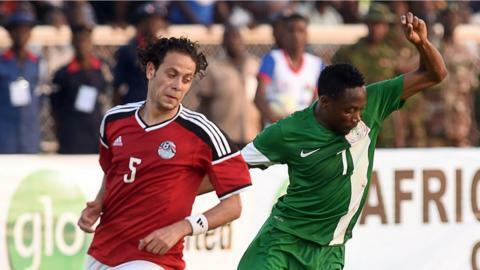 Nigeria missed out on the last Nations Cup finals in Equatorial Guinea despite winning the 2013 edition in South Africa. Egypt have remarkably not competed at the finals since winning the last of three back-to-back titles in 2010. In Group M, South Africa know they must beat Cameroon if they are to keep alive their hops of qualifying. Bafana Bafana drew 2-2 away to Cameroon on Saturday and are hoping home advantage will help them achieve a better result on Tuesday. However, they go into the game with a significant injury list: goalkeeper Darren Keet, defenders Anele Ngcongca and Thabo Matlaba as well as midfielder Mpho Makola are all ruled out. Goalkeeper and captain Itumeleng Khune said: "It is still possible to get to Gabon, but we have to keep our heads high and fight for the remaining nine points. "We cannot afford to throw the towel in now - we have to start with Tuesday's clash to start collecting the points. With the kind of football we are playing we can still do it, but it starts with us, we have to believe that we can. "We cannot afford to drop any more points." Emmanuel Adebayor will end a self-imposed exile to return for Togo in their Group A match against Tunisia. The Crystal Palace striker last played for his country in June 2015 and rejected a call-up for the first match between the sides, which was played in Monastir on Friday and was won 1-0 by Tunisia. He wrote on his Facebook page: ""Coming together is a beginning, keeping together is progress and working together brings success. "Let's go get this win together boys! May God be with us today." Tunisia, Togo and Liberia all have six points, with three games remaining.